We make the finest embroidered patches & emblems. Soccer Teams, National and Local Sports Organizations, National Religious Organizations, Camps, School, Church – for over 60 years we specialize in making emblems for youth groups. We make custom emblems for the largest and smallest corporations as well as all sizes of local, state and federal government agencies and departments. Our customers benefit from our expertise and experience in making hundreds of millions of emblems over many decades. Promotion, advertising, awards, travel, novelty, special events, rewards, recognition-just about any category of patch is made in our factories. If it can be made, we can make it. Since 1890, The Chicago Embroidery Company has been manufacturing and providing the highest quality embroidered products and emblems at low prices. Still privately owned, for over 125 years we have made high quality patches for just about every customer you can think of. The Chicago Embroidery Company was founded in 1890 by Johannes Bodenmann, who came to the United States from Switzerland and eventually settled in Chicago in the later part of the nineteenth century. 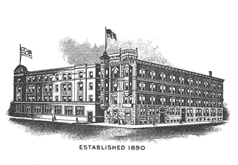 He used his lace making skills and knowledge to form the company, which was formally incorporated in 1894. During long cold winter nights, Swiss farmers and their families concentrated on handicrafts that could be sold for extra income. This tradition, dating back hundreds of years, led to the development of distinctive Swiss lace, an intricate, interlaced pattern of threads, looped, twisted or braided to other threads, known throughout the world for its quality and workmanship. Handmade Swiss lace was often used in decorative clothing, curtains, table linens and many other applications. Lacemaking and embroidery changed during the Industrial Revolution with the development of power looms, which greatly increased production efficiency and provided the capability to reproduce any number of identical pieces. 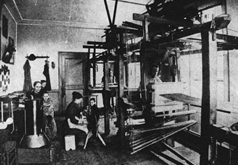 It was these looms that Johannes used in the early days of The Chicago Embroidery Company. The company prospered, but Swiss-style lace fell out of fashion in the 1930s. During this period, The Chicago Embroidery company was asked to stitch designs on men’s socks, however no one knew how do to this because the sock had to be stitched after it was made and the power looms could not make a design without stitching the sock closed. 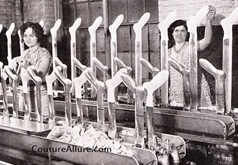 The company met this challenge by creating a special holder for the socks that allowed the power looms to stitch a design without ruining the sock and in 1938, The Chicago Embroidery Company was granted a U.S. patent for a specialized hose embroidery machine. 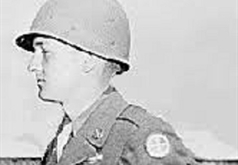 With the start of World War II, the U.S. military suddenly needed millions of embroidered patches to signify rank, unit, and specialty of members of the armed forces. The U.S. Government ordered The Chicago Embroidery Company to begin making embroidered patches (also known as shoulder sleeve insignia) and the looms were converted from lace making to war patch production. This conversion led to a new product in the USA, mass production of embroidered patches. The embroidered patch market was born. 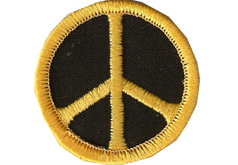 After World War II ended, a Chicago cap manufacturer approached the company with an order for patches to be sewn on to caps and sold to members of the Boys Scouts of America. 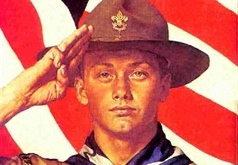 This was the beginning of many decades of a business relationship between Chicago Embroidery and the Boy Scouts of America and other scouting organizations. In the years following the war, the company continued making military patches and many different designs for large and small companies, police and fire departments, municipalities, youth groups, sporting organizations and others. During the 1960’s and ‘70s, decorative patches became a fashionable clothing accessory for the general public. 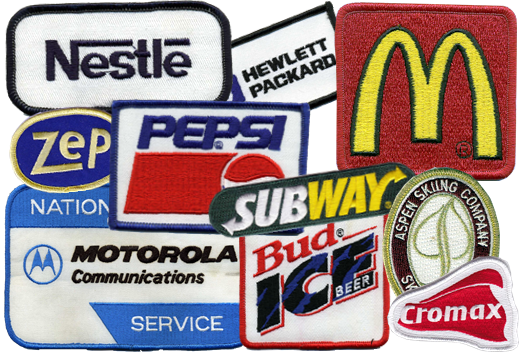 Organizations used more and more patches for uniforms, Chicago Embroidery was a prime contractor for the National Boy Scouts of America which kept adding new members, and the company grew. Chicago Embroidery opened a second factory, and with three shifts working six days a week on more than 20 looms, millions of patches were produced and shipped around the world. With the introduction of new direct embroidery technology in the 1980s, the embroidered patch industry underwent a major upheaval. Computerized digital sewing machines allowed intricate designs to be sewn directly onto shirts, jackets, caps, or other items. 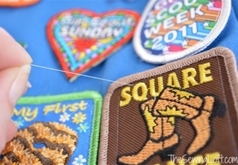 While customers continued to buy patches, demand for patches began to decline. By the turn of the millennium, direct embroidery had taken a huge portion of market share away from patches, and low-cost competition from the Far East pressured U.S. patch manufacturers. In 2007, after three generations of family owners, the company was sold to a former employee. For the first time in its history, a Bodenmann family member was not at the helm. The company continues to offer a full line of multi-color patches for a variety of uses and organizations and ships patches around the world. Our customers include the United States Armed Forces, Federal agencies, state and local agencies, the National Boy Scouts of America, the Girl Scouts of the USA, numerous Boy Scout and Girl Scout Councils, numerous companies large and small, uniform companies as well as small organizations. Since 1890 we have made emblems for just about every customer you can think of. Our Quality is unmatched and our customers agree. We use the latest state-of-the-art emblem manufacturing to produce your custom embroidered emblems. Our reputation speaks for itself. All products are fully guaranteed. You must be 100% satisfied with every detail of your custom emblem or we will re-make the order at no charge, including the shipping charges. We guarantee your delivery date and our on-time delivery or your emblems will be shipped to you absolutely free of charge. Since 1890 The Chicago Embroidery Company has made hundreds of millions of patches for all kinds of customers --from very large companies and agencies to very small clubs and individuals. Take a look at some of their comments. Access to deep, deep knowledge and experience. We are the experts.